Boost by Lyft, TAG Restaurant — Denv.Her. It's me. It's she. I'm her. Hi beautiful denv.her. babes! Lyft wants to take you out to dinner and boost your ride! Try out the new Boost By Lyft feature and visit a participating restaurant in the Denver area on Lyft and get access to crazy good deals across the city! 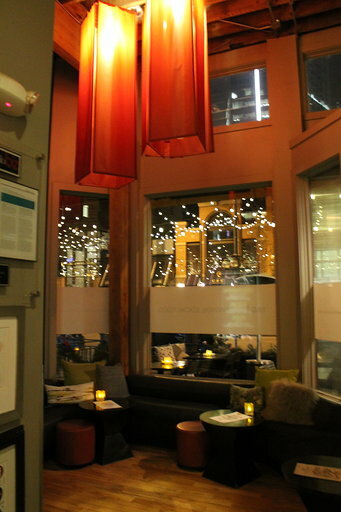 Last night, Treslyn and I got dinner at one of our favorite Denver restaurants, @tagrestaurant through Boost! Check out #BoostDenver for 20% off your TAG bill of $50, $100, $150, or $200! For those of you who haven't been to TAG Restaurant, hop in your Lyft and go there ASAP. It's such a trendy & eclectic spot with great tunes to bop to while you enjoy a plethora of inspired dishes that are sure to zing your taste buds. To start off our meal, our knowledgeable and spunky server Beth, brought us an amuse bouche of brie topped with a pear and pepper jam and finished with a candied pecan. This amuse bouche was SO yum and set the tone to a flavorful dinner. We then began our meal with some of TAG's OG dishes - the Taco Sushi, Kobe Beef Sliders, Flash Seared Hamachi, and the Angry Volcano. The OG Taco Sushi features charred Hawaiian ahi (we obviously had to have it) with sushi rice and li-hing mango salsa in a wonton taco shell. The four mini tacos sit on top of a delicious scoop of guacamole. YUM. We love this little tacos but they are very filling! These can definitely be split between four people. The Kobe Beef Sliders - Holy cow (pun intended) - this OG dish is a slam dunk. The Kobe sliders are made from Snake River Farms Kobe beef and are topped with carmelized shallots and gorgonzola aioli on a brioche bun. #delicious . The sliders come with a side of duck fat fries - & these aren’t your typical side of fries. TAG’s duck fat fries are dusted with sugar and cayenne pepper to give them a sweet and spicy kick that will have you shoveling these bad boys into your mouth lol. Legit SO freaking good. The sliders and duck fat fries are hands down my fav dish from TAG. Second fav dish from TAG? The Flash Seared Hamachi. This is a must order not only because it’s delicious, but also because they sprinkle pop rocks on top of the hamachi once it arrives at your table. That’s right - Pop Rocks. The Hamachi is beautifully displayed in a circle, garnished with jalapeno, baby tatsoi, Japanese myoga, and drizzled with yuzu white soy then topped with the candy. This dish is savory and sweet and just so, so good. Our final selection from the O.G. part of the menu was the Angry Volcano. This sushi roll contains yellowfin ahi and avocado. It is topped with a fresh jalapeno slice and drizzled with dynamite sauce (& the dynamite sauce is spicy mayo perfection). Up next from the seasonal sushi menu was two orders of nigiri which comes with hamachi, salmon, tuna, boquerones (anchovies). The nigiri was v standard and we probably would not order again (unless we ask for dynamite sauce on the side for dipping). The fish is fresh but the flavors here are really underwhelming - except for the boquerones…which we wished would have been less flavorful lol. We aren’t big anchovies fans. We asked our server, Beth, for recommendations for entrees and after glowing reviews of the seasonal Cauliflower and the large plate Pan Seared Monkfish, we selected those two dishes. The Cauliflower is sauteed with pancetta to create a delicious base flavor. The dish is then plated on top of a vadouvan curry yogurt sauce. The cauliflower is garnished with fresno chiles, grapes, and pistachio. This seasonal plate was solid and we really enjoyed the creativity of the dish. The Pan Seared Monkfish was a solid entree choice. The monkfish was cooked perfectly and paired wonderfully with the wild mushroom civet, uni soy butter, and risotto. The risotto really took this dish up a level. Huge thanks to Lyft, Boost by Lyft, & TAG Restaurant for hosting us! #Ad #boostbylyft The ultimate ride & dine! Disclaimer: denv.her. is a personal blog collaboration that contains opinionated and ever changing content. We make no representations as to the completeness or validity of any information on this site and will not be liable for any errors arising from its display or use. The views, information, and opinions expressed on the blog denv.her. are solely those of the author(s). This blog contains the author(s) personal opinions. The primary purpose of this blog is to entertain through these opinions - often through satirical means when it comes to the #ventsesh column. All information is provided on an as-is basis. It is the reader's responsibility to verify their own facts - assumptions made in the analysis of this blog are not reflective of the position of any entity other than the author(s). The opinions expressed on denv.her. do not necessarily reflect the official policy or position of any other organization or company who has partnered or collaborated with denv.her. denv.her. has ever changing content that includes conversations and comments. Comments on denv.her. are the sole responsibility of their writers - direct results of something written in a comment are the writers’ responsibility. The authors and the blog are not to be held responsible for the reuse of cited/un-cited copies of content within this blog by others. Thank you so much readers & enjoy!